Help! My PageRank just Dropped from 6 to 3. Did I get a Penalty? We have a client in the automotive industry that publishes a pretty popular magazine. They contacted us in a panic about their PageRank which has dropped from a 6 to a 3. They have also had a recent drop in traffic and rankings because of the PageRank decrease. We are trying to troubleshoot the issue for them. What should we be looking for? They did not receive a Google Webmaster Tools notice. Answer: What a lot of people don't understand about PageRank, especially Toolbar PageRank, is that it is HORRIBLY out-of-date. The PageRank that you see in your browser and in your client's browser is a minimum of 3-6 months old. So to say it's unreliable or stale, or even useful (when evaluating how your site 'truly' ranks online these days), is up for substantial debate. It's also estimated that Google uses well over 200+ algorithmic ranking factors, continuously, to determine how a site will rank competitively. 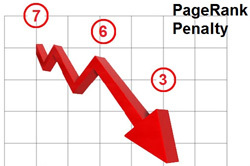 With that being said, even when there is a regular PageRank update (and they are becoming more and more infrequent) a PageRank drop from 6 to a 3 is clearly not normal.